When Katrina Kaif came to meet Riteish Deshmukh, she only had a handbag. But, when she goes to her office, she had a polybag along with handbag. 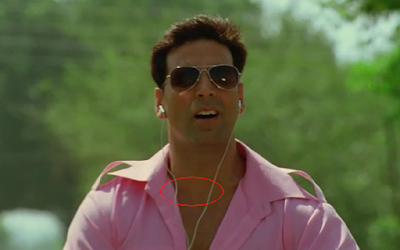 Here, Akshay Kumar is using headset. But, when Katrina calls him, there was no headset in his ear. It disappeared suddenly while he was still driving. If you remember Aryan goes to meet Gaurav at Delhi after Gaurav broke into his house. If we see below picture, it shows Gaurav enters in Aryan's home on 24th October. So Aryan must have visited after that. Also at Delhi, he performed at Dushera programme at Indra Vihar. But, in 2015, Dushera was on 22nd October. 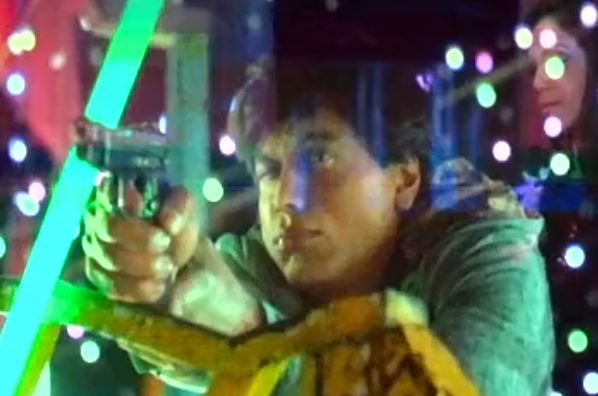 When Gaurav shoots Aryan, we can see the pistol is pointing straight. But, Aryan is standing way down from him. So his must have to tilt his pistol to shoot him. As we can see that on Madame Tussauds' website, rule no 6.1.3 clearly states that "No consumption of food or drink without the express permission of Merlin". But Gaurav is seen holding beverage at Madame Tussauds. When Gaurav goes at Aryan's house and Aryan's wife tells him to appear before camera. The date on two different frames are different. When Gaurav was taking selfie before going to Mumbai, he was holding his phone vertically. But at the end of movie, when his photos are shown, the selfie is shown in landscape mode. 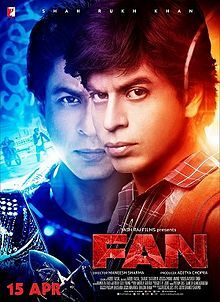 Also the position of trophy in Gaurav's hand changes. When Nikhil was in New York, his mobile is showing "Vodafone IN" network and as much as i know IN is used for India. When Aditi Rao reaches London, she has three suitcase with her. But next day, when was going to New York, she only had two bags. When Bajirao accidently hits Mastani in battle fiels, she gets injured. Next day, when Bajirao meets Mastani, he touched her wound with his heated dagger and says"ज़हर फैले ना इसलिए घाव जलाना पड़ा "
Doesn't the doctor/vaidya of Bundelkhand had given her medicine a night before when she was injured. So Bajirao was actually wooing her by showing his knowledge. The centre of the Sheesh Mahal is reflected on to the mirrors and into Kashi's room. But, in night also so much light is coming through the window and Priyanka Chopra is able to see Deepika embracing Ranveer at night. 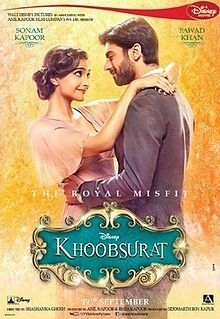 When Bajirao return after winning battle of Bundelkhand, in one the scene, Kashibai mouths the dialogue "हीरे में हीरा हो तो उसे कहते हैं कोहिनूर..." But, Kohinoor name was given to the diamond by Nadir Shah in 1739 and Battle of Bundelkhand was fought in 1729. 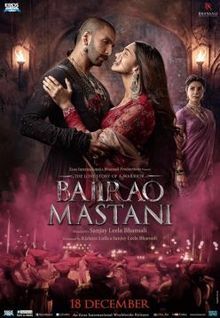 When Mastani puts a blood-tilak on Bajirao's forehead, it it a drop. But few shots later, it changes to smudge from drop. Also we can see the change in the place of motif of cloth winded around the Bajirao's neck in above two pictures, while Bajirao was standing in same position. In this scene, Sonam Kapoor was not wearing headphone. But in next shot, headphone was hanging around her neck. When Mili made video call to her mother.Her mother was standing far from the tablet. Then who picked the call? We can see that in below picture, the scenery is of night. But in next scene, when Mili calls her mother, the time on tablet shows 4.30 pm. 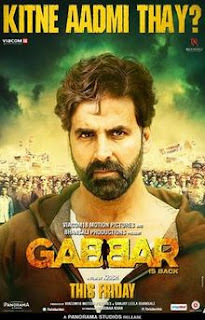 In the movie, Gabbar hangs the corrupt officials on high lamp posts or bridges. How did they do it without coming in notice to anybody. Even when police rescues the body, they take much time and uses cranes. But Gabbar does it magically & without any hassle. When CBI officer wants to enter in National College, the students says that police & rowdy are not allowed in college. But, during first half of movie, the goons enter in college and were beating students. The CD of Gabbar only contains audio, they why all these students are staring at screen? Here we can see that policeman is standing in the shadow of building. But in next shot, he is shown standing in the shadow of vehicle. When Akshay throws Digvijay Patil, he was facing down. Suddenly in next shot, he was facing up. The terrorists were roaming all over the city, may it be railway station, mall, multiplex and no one ever searched them and they never came under the metal detectors which are usually installed at those places. For one sec, if we asume that all components of bomb is made of plastic then also the army men who were after the terrorists were carrying gun which indeed is made up of metal. Even they never get detected. But, in other shot it is closed. The backgrouund from this angle has board of "Wellington Cricket Club". But, suddenly it changes to playing ground. Akshay is holding suitcase in his right hand. 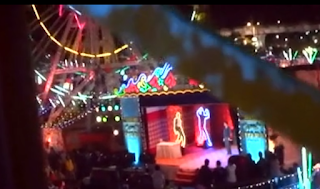 In next shot, it is shown in his left hand. Given the fact that he has a bag already in his right hand, how he had switched it?